There is nothing quite like a Disneyland Character Breakfast. Dining with a Disney character is something that you must do at least once in a lifetime! There are various options of Disneyland Character Breakfasts. Which is the best? Find out more in our Disneyland Character Breakfast Guide. There are four options for a Disneyland Character Breakfast. These are Mickey’s Tales of Adventure Breakfast at Storyteller’s Cafe, Donald Duck’s Seaside Breakfast and Goofy’s Kitchen. These Disneyland character dining breakfasts are all outside the parks. The good news is that you do not need a park ticket for any of these character dining experiences. The only character breakfast inside the park is the Plaza Inn Character Breakfast. This is inside Disneyland park. There are no character dining options inside Disney’s California Adventure park. Disneyland Character dining is a whole lot of fun. However, it is good to know just what is involved if you have never been to a Disney character breakfast. Disneyland Character breakfasts are great for families with kids. However, this isn’t to say that you can’t go if you do not have kids traveling with you! 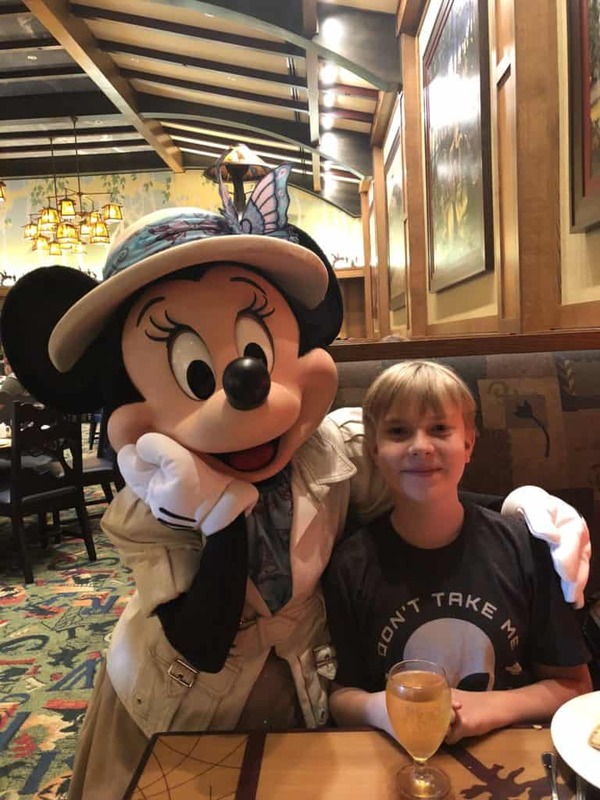 Meeting Mickey Mouse over breakfast is a unique experience at any age! If you do have kids with you then you do need to prepare them a little. If they have already met the characters in the Disney parks then you will know how they are going to react to the characters. The Disney characters do an amazing job of knowing how to interact with people. However, some children are going to be scared. My youngest used to hide under the table if he saw a character approaching! So be aware that this may happen. Take your time at your character meal. All Disneyland character dining experiences are on the pricey side, so take your time to enjoy the experience. Be aware that the restaurant experience will be lively and loud. Don’t expect a quite experience! The energy level is high and so is the noise! It is likely that you will have to book ahead for a Disneyland Character Breakfast. They are extremely popular. You can make a reservation at any Disneyland restaurant ahead of time. You can make Disneyland dining reservations online or call (714) 781-DINE or (714) 781-3463. The easiest way is to make the reservations on your Disneyland App. There you just input the details of the size of your party and required date and it will let you know the options. The Disneyland App is by far the easiest way to book Disneyland dining. In just a few clicks you can easily see what is available. Then you simply choose which one you want, reserve it and get a confirmation number. In order to book you will have to give a credit card guarantee. Always check the individual restaurant cancellation policy. However the usual policy is that you have to cancel at least 24 hours ahead or your credit card will be charged $10 per person. There are four Disneyland character breakfast options. One of these is in the park, but the other three are outside the parks located at the Disneyland resort hotels. This has the advantage that you do not necessarily need a park ticket to have a Disneyland character dining experience. This can make it a good option for a non park day. As with all character experiences remember that you cannot guarantee that a particular favorite will appear. When we say which characters are usually included this is always subject to change. Explain to your kids that their favorite may be having a vacation. This will help soften the blow if Goofy can’t make it. Always remember to take an autograph book with you. It is a lot of fun collecting character autographs. Each of the Disneyland character breakfast locations will have a Disney photographer in the restaurant. The only one which doesn’t is Storyteller’s Cafe. It’s a nice touch because you can get some great photos. However, if you want to save money it is perfectly fine to decline to buy the photos. Always take your own camera or take photos on your phone. You will want to remember the experience! How much does Disneyland Character Breakfast cost? That depends upon the particular Disneyland restaurant that you choose. In our guide we will let you know how much each of the Disneyland Character Breakfasts cost. All prices are correct in January 2019. The costs quoted do not include tax or tip. Disneyland Annual Pass discounts area available. Mickey’s Tales of Adventure Breakfast is held every day at Storytellers Cafe in Disney’s Grand Californian Hotel. For years this venue was Chip and Dale’s home with no Mickey in sight. However, this character experience was re-imagined in 2018 to feature Mickey and Friends. You can expect to see Mickey and Minnie Mouse, Pluto, Chip and Dale. One of the things which I really like about this character experience is the cute adventure outfits which Mickey and Minnie wear. Just can’t get over how cute the shoes are! Storytellers Cafe is one of the most beautiful of all the Disneyland restaurants. The Arts and Crafts theme of the Grand Californian is beautifully captured here. As soon as you walk into Storytellers Cafe you just feel a sense of calm. Well you do until Pluto arrives! The characters who usually appear at Storytellers Cafe breakfast and brunch are Mickey and Minnie. Chip and Dale and Pluto. The breakfast buffet is set out in the middle of the restaurant. 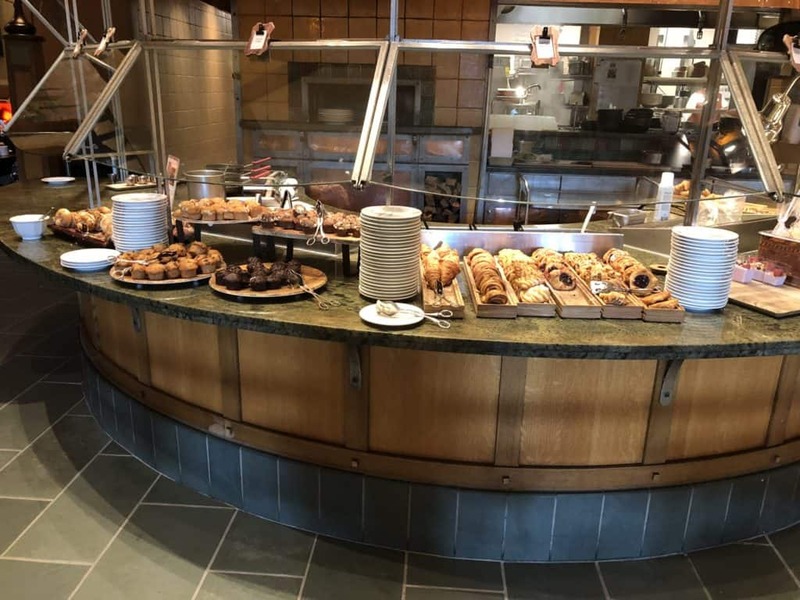 It has the options that you would expect such as scrambled eggs, breakfast potatoes, bacon, sausage, Mickey waffles, pancakes, pastries and fruit. It is always good to go to the omelet station as the food is freshly cooked. Sometimes the scrambled eggs can have been out a long time and are just not that great. Mickey’s Tales of Adventure costs $44 for adults and $26 for children. Remember that a child at Disney is aged 3 to 9. Yes it is a lot of money, particularly if you have a large family. However, it is a fabulous way to meet the characters. The food is pretty good and the setting is one of the most beautifully themed restaurants in Disneyland. Breakfast is served from 7:00 a.m. to 11:25 a.m. They close half the buffet at around 11.10 am to set up the brunch items. If you arrive late you have a choice of additional brunch items. 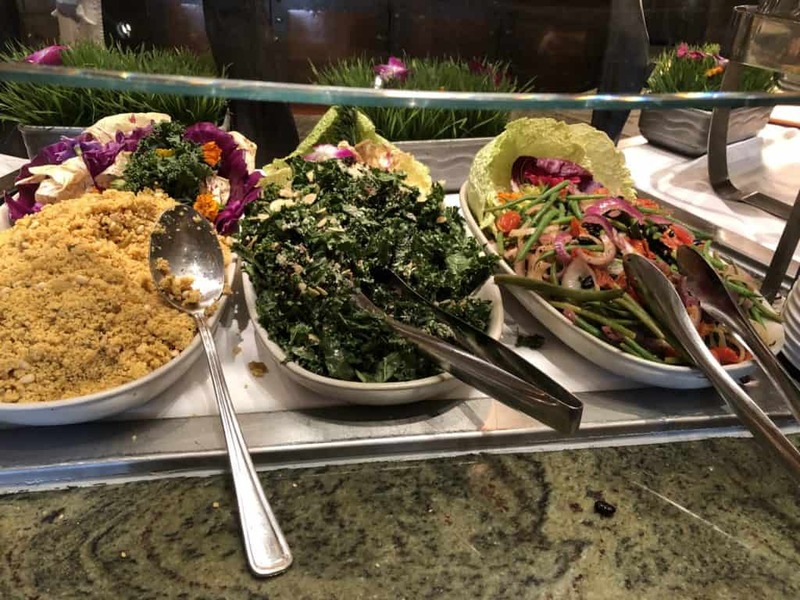 This includes a Carving Station, a selection of Salads. The most tempting thing about Brunch at Storyteller’s cafe is the dessert items! Perhaps the least known Disneyland character breakfast is Donald Duck’s Seaside Breakfast. 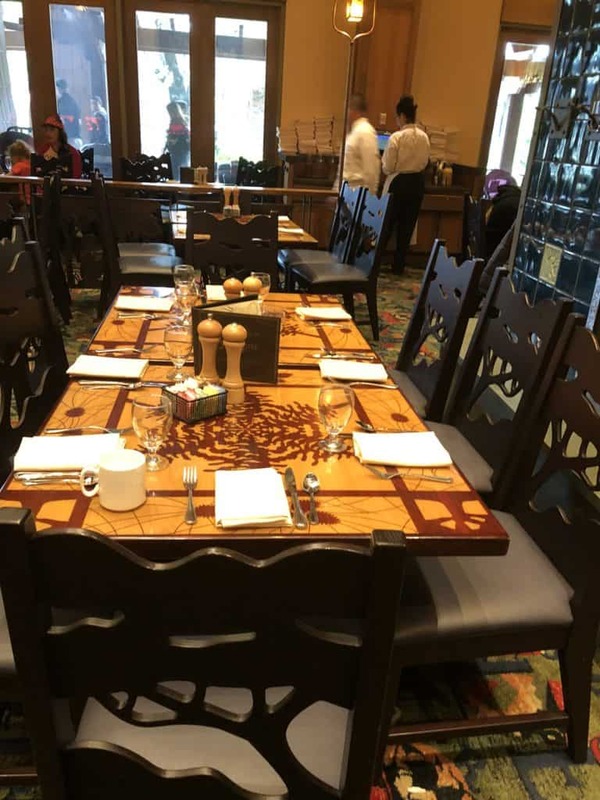 It is located at Disney’s Paradise Pier Hotel in the PCH Grill restaurant. Here the characters are usually Donald, Daisy, Stitch, and Minnie Mouse. The Paradise Pier does not have the grandeur and elegance of the Grand Californian. It is a much more laid back and traditional character breakfast setting. It is also very loud! One thing that we really like about the Donald Duck Seaside Breakfast is the cute beach outfits which the characters wear! You will always be guaranteed a photo of your party and Donald. Before you are seated you will be shown to a beach scene background to have our photo taken with Donald. The food is pretty good for a character buffet. You get all the usual breakfast favorites. Scrambled eggs, bacon, sausage, pastries, fruit, smoked salmon. A particular favorite is the Banana Foster French Toast. Donald Duck does not make the rounds of the tables, but you will get plenty of time with Daisy, Stitch and Minnie Mouse. The advantage of this restaurant over Storytellers is that is has a lot more space. This makes the character interactions a lot better simply because they have more space to move around. I also think that the service is better here than in Storyteller’s Cafe. Even though these are buffet style meals, the service still matters a lot. You need someone to quickly take away dirty plates and to replenish the drinks. Another advantage is that this breakfast is slightly cheaper than Mickey’s Tales of Adventure Breakfast. It is $39 for adults and $21 for children. 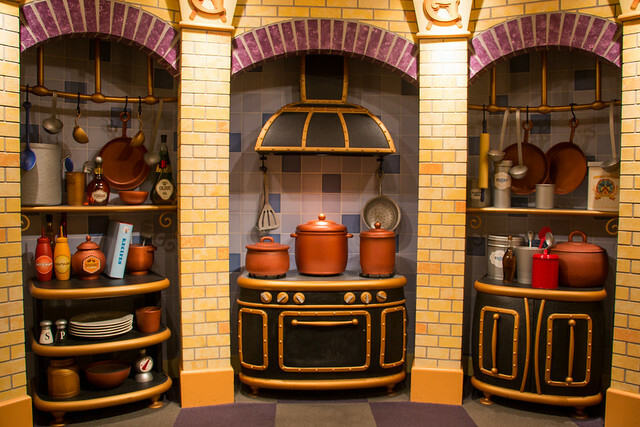 Goofy’s Kitchen has been around for many years. Tucked away inside the Disneyland Hotel, this is one of the most popular Disneyland character breakfast locations. It is also the highest energy and certainly the loudest! Goofy, Minnie, Chip, Dale, and Pluto usually appear at Goofy’s Kitchen. Whilst you are waiting to go into breakfast you can meet Goofy or Mickey. They alternate in the photo staging area. 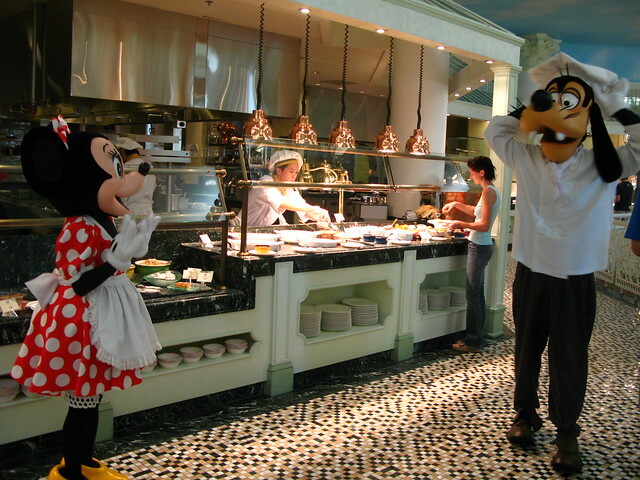 There is a really cute background for these photos and of course Goofy and Mickey are dressed in their chef’s gear. I think this is one of the best character photo opportunities. The buffet offers the usual breakfast fare. Goofy’s Kitchen was designed as a character buffet restaurant so it is very well set out and easy to access the buffet. You will find your usual breakfast favorites, but Goofy’s Kitchen also has the most diverse options for breakfast. Anything goes here and your younger kids will probably enjoy the food choices here more than anywhere. Want pizza for breakfast? You can have it at Goofy’s Kitchen! If you want to try Peanut Butter Pizza this is the place! Kids will also love the fact that they can choose from a variety of ice creams and toppings. Cookies for breakfast are also very popular! 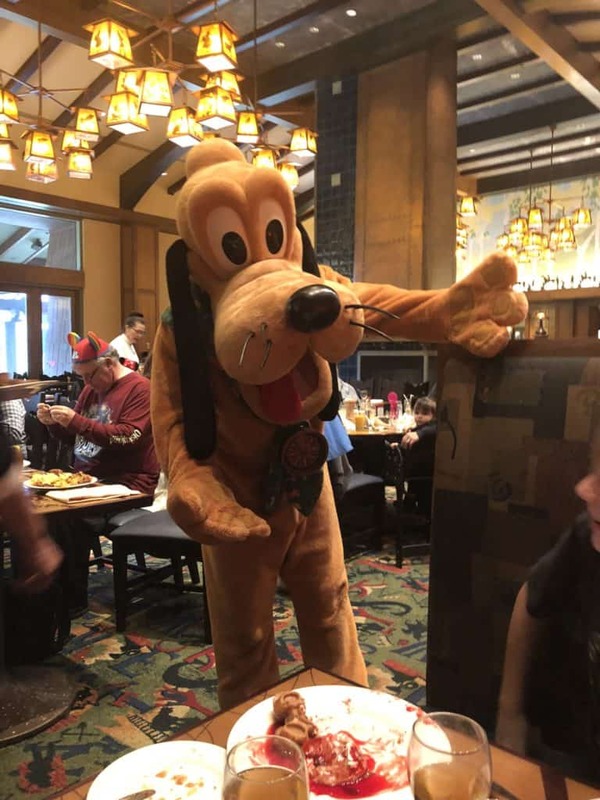 The cost of Goofy’s Kitchen breakfast buffet is $39 per adult and $23 per child. 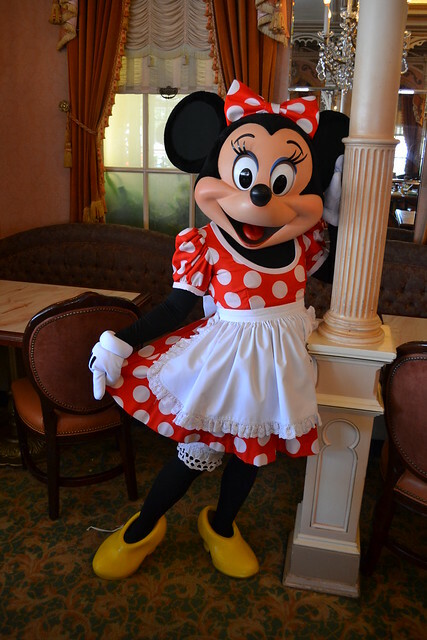 The Plaza Inn Breakfast with Minnie and Friends is the only option which is located inside Disneyland park. We think that Plaza Inn is the best place for character interactions. It is different to the other locations. You are guaranteed to see Minnie. You will meet her when you check in. Minnie Mouse is positioned outside the Disneyland Plaza Inn so that you can get a photo with her before you go in for breakfast. You can take your own photo, but there are Disney photographers on hand. During your breakfast they will find you at your table to show you the photos and offer you the photo package. This starts at $37 so let you be the one to decide if that’s worth it! However, when we have visited Plaza Inn there has always been a great collection of different characters. You never know quite who you are going to see but over the years we have seen Fairy Godmother, Captain Hook, Rafiki, Eeyore, Winnie the Pooh, Tigger, Goofy, Max and Chip and Dale. Some of the best interactions we have had are with Captain Hook. He can be a bit scary for younger children, but he is great for the adults and older kids. 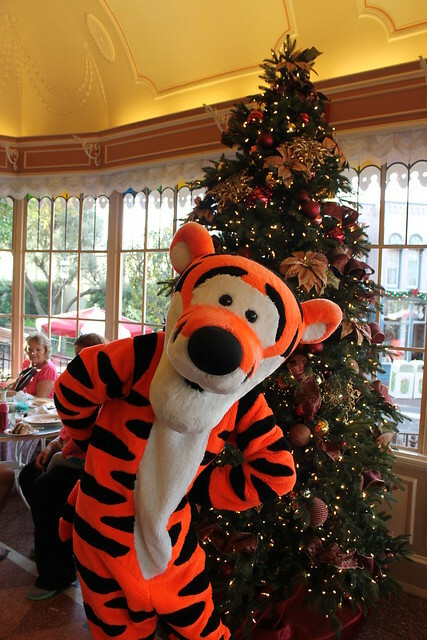 Tigger is always a whole lot of fun. The Plaza Inn is the only Disneyland Character Breakfast where you pay on entry. You will check in at the outside desk and then be shown to the cashiers who are stationed just inside the restaurant. You will pay, then get your ticket. You will give this to the Host who will show you to your table. 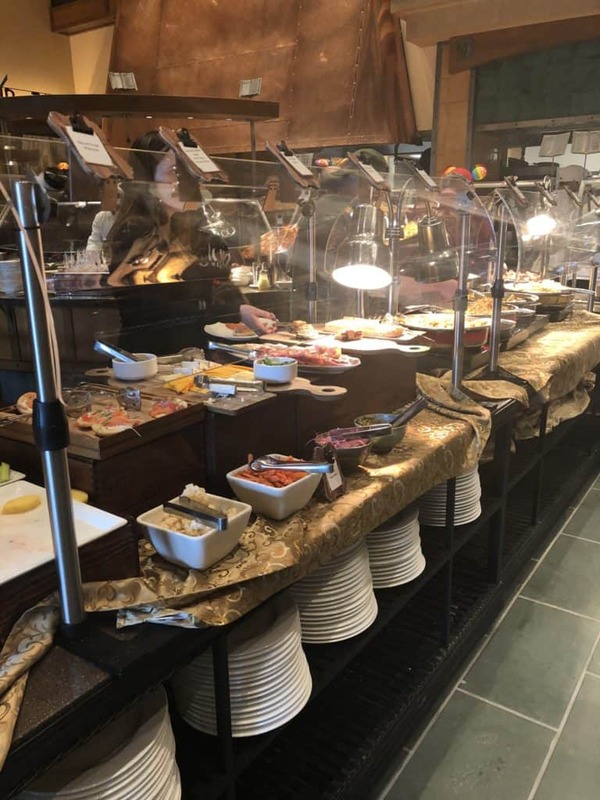 The breakfast buffet food is pretty much as you would expect and very similar to the other character dining options at Disneyland. You will always find scrambled eggs, breakfast potatoes, bacon, sausages, Mickey waffles, pancakes, cereal, fresh fruit and pastries. The quality of the food is unfortunately mediocre at best. You come here for the Disney character experience. For that we think it is excellent value, particularly if you have younger children. 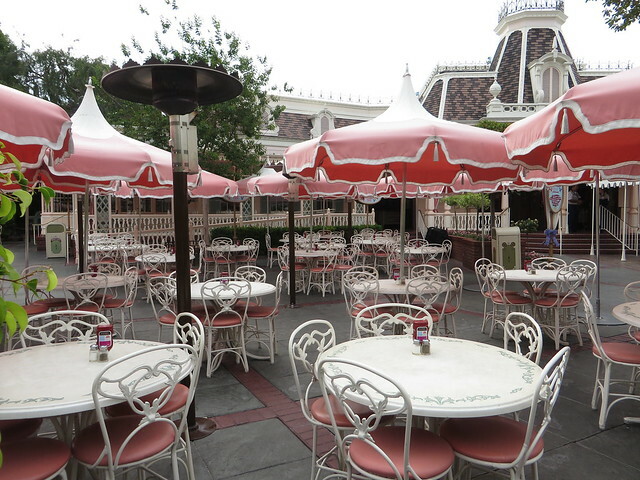 Plaza Inn is the only Disneyland character breakfast restaurant which has outside seating. As the weather is great most of the time in Disneyland, this can be a good choice. The Plaza Inn is also the only Disneyland location where you can meet the characters and eat your Mickey Waffles outside. We think that the outside seating is a good choice if you want a quieter, more relaxed experience. However, you are of course further away from the food! A good compromise is a seat on the verandah which is just outside the restaurant. The characters are good at dividing their time between inside and outside. You may sometimes see a character who doesn’t visit outside. If this is the case, mention it to a Cast Member and they will help you visit the character inside. 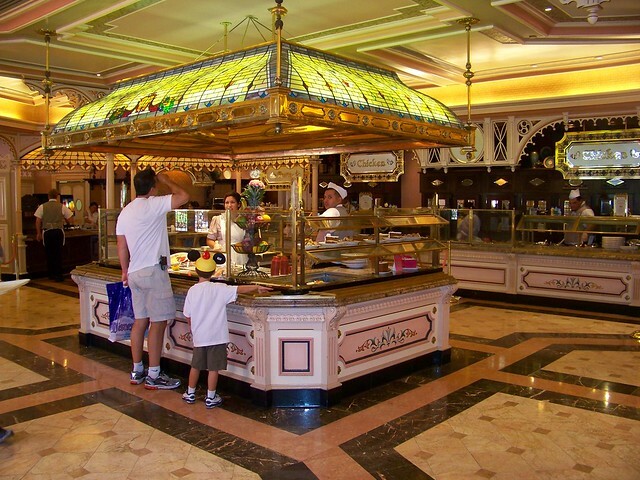 The cost of the Plaza Inn breakfast buffet is $34 per adult and $19 per child. A new Disneyland character dining experience has just bean announced. We don’t have too many details about it right now, but will update as soon as we know more. Disney Princess Breakfast Adventures will be the only place that you can dine with the Princesses in the Disneyland resort. What we do know about Disney Princess Breakfast Adventures is that it will be located in the Napa Rose Restaurant. 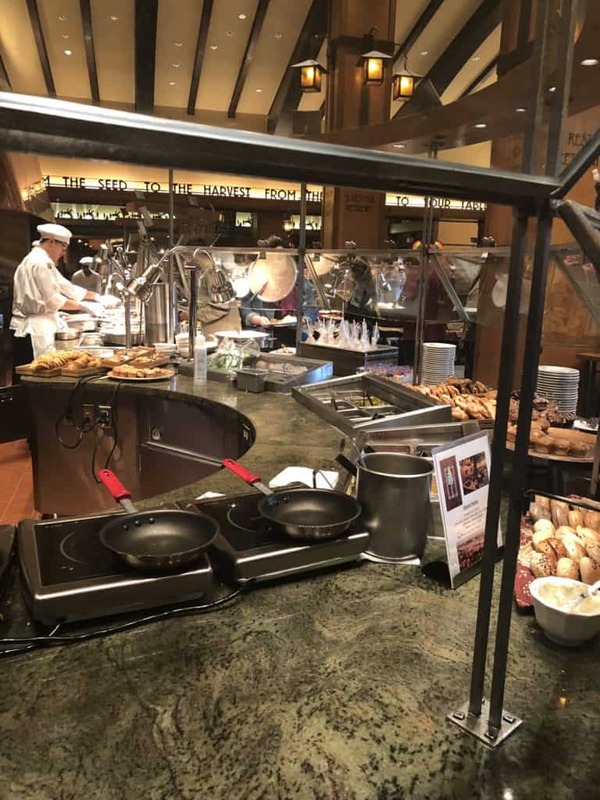 As this is located in Disney’s Grand Californian Hotel and Spa, you will not need a park ticket to enjoy Disney Princess Breakfast Adventures. This new Disneyland character dining experience will start on March 20 2019. It will be offered every Thursday through Monday between 8:00 AM and 12:00 PM. Napa Rose restaurant is absolutely beautiful. As one of Disney’s premier dining experiences this is most definitely a place fit for royalty. Disney has announced that Napa Rose will be transformed into “a charming new storytelling environment”. It will be interesting to see what this actually means! The Disneyland Princess Breakfast will include personal interactions, photo opportunities, a fun takeaway bag and themed activities. We are guessing that it will be something like the Disney Cruise Royal Court Royal Tea which is offered on select Disney cruise sailings. This costs $210 for children and $69 for adults. At $125 per person for both adults and children the Disney Princess Breakfast Adventures experience does not come cheap! Tax and gratuity is not included. So you are in for several hundred dollars at least this Disney Princess dining experience. Disney has announced that the food will consist of a three course breakfast. There will be cold starter options which include Sunrise Citrus and Vanilla Bun with Raspberry Glaze, Assorted Fruit Slices and Berries and an Egg Custard Served in its Shell with Parmesan Crisp and Ketchup Caviar. Kids entrees include House Made Mac & Cheese, Mini Chicken & Princess Waffles and Beef Sliders. For the adults the options include Shepherd’s Pie, Slow Braised Short Ribs and Pork Belly. Side dishes include side dishes like Roasted Seasonal Root Vegetables & Heirloom Potatoes, Artisan Breakfast Sausage,and Bangers. Desserts at the Disney Princess Breakfast Adventures will include Chocolate Princess Cake Pops, White Chocolate Slipper with Strawberry Ganache, Petite Fruit Tarts and more. Will the experience be worth the cost? We are sure it will be a great way to have some quality time with the Disney Princesses. However, $125 is a high price to pay so it remains to be seen how the experience actually is. We are sure that the Disneyland Princess Breakfast will be very popular. You can Book Online or call (714) 781-DINE or (714) 781-3463 up to 60 days in advance. You can also use the Disneyland App to book. 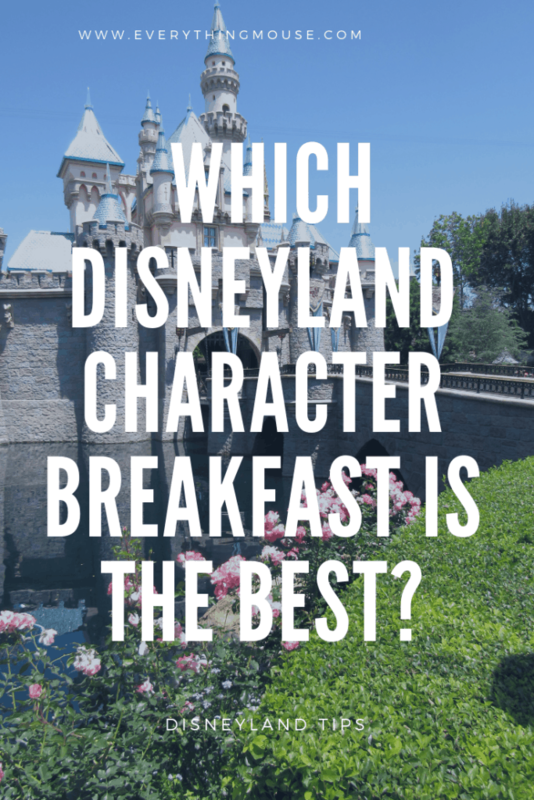 Which Disneyland Character Breakfast Meal is the Best? Each of the character breakfasts at Disneyland offer something a little bit different. 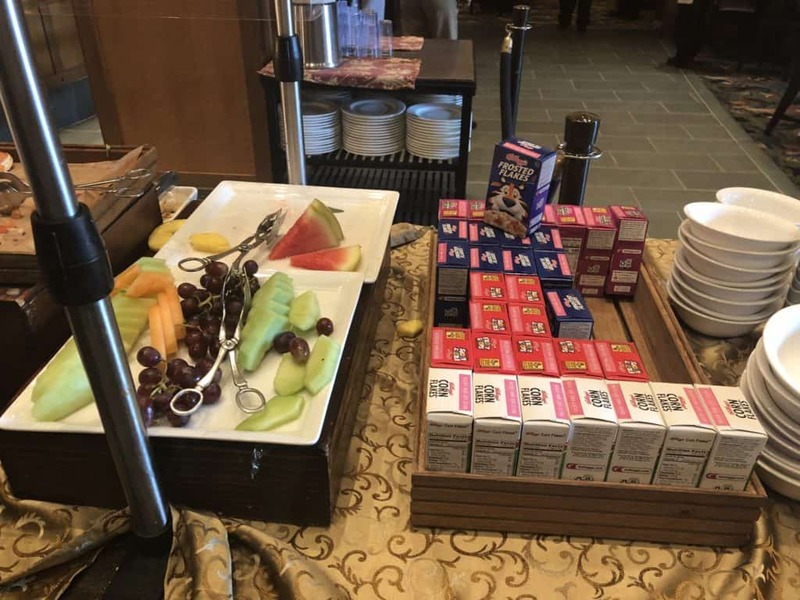 The quality and variety of the food is pretty similar for all the character breakfasts. If we had to pick one and say the food quality has the edge it is probably Storyteller’s Cafe for us. However, do not go to a Disneyland character breakfast expecting amazing food. 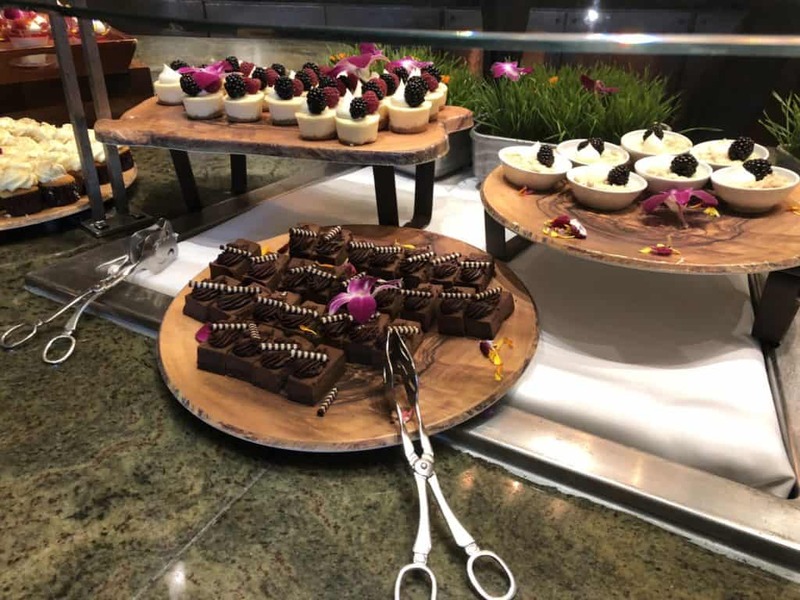 It is a buffet and whilst Disney does these very well, that kind of food has it;s limitations. Each of the character breakfasts has a different atmosphere. How should you choose which one to go to? We would say that as the most important thing is the character interactions, start with thinking about which character you would most like to meet. The most sophisticated venue is Storytellers Cafe. It has beautiful decor. 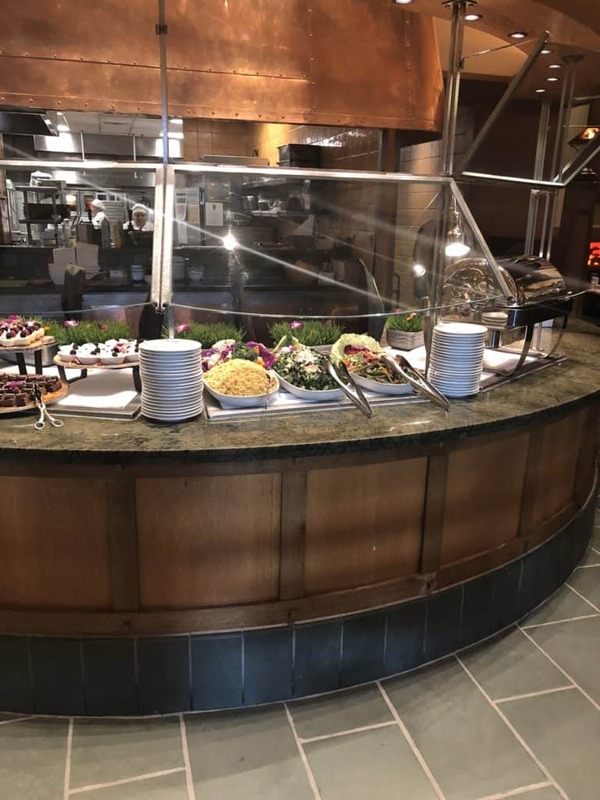 However, it is not specifically designed for character buffets and therefore the area around the tables is a bit cramped at times. We think that the best restaurant to meet the characters is Plaza Inn. You have a larger selection of characters here than any of the other options. The disadvantage is that you do not know who you will see, other than Minnie Mouse. 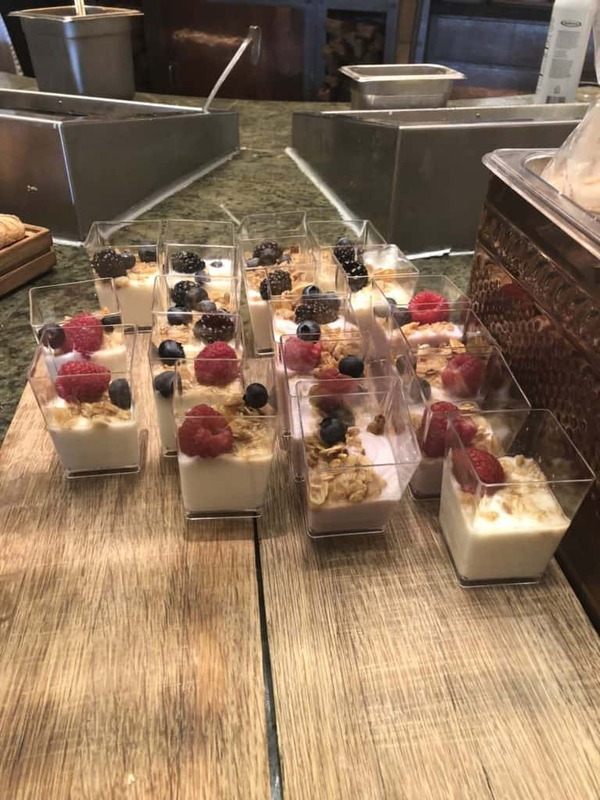 Disneyland Plaza Inn probably has the worst food quality of all the Disneyland character buffets. If you want to see a specific character always be aware that appearances are not guaranteed. However, there are some characters who it can be difficult to see elsewhere. 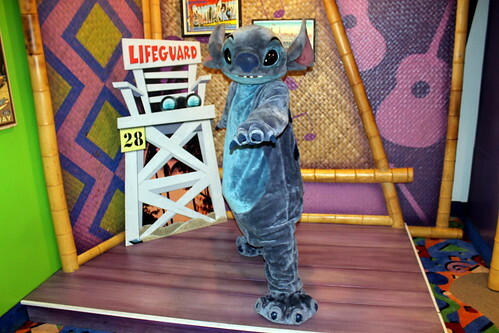 One example of this is Stitch who is very difficult to find. The only place you can meet him other than Donald Duck’s Seaside Breakfast is that Chase Visa Card Holder meet and greet in California Adventure Park. 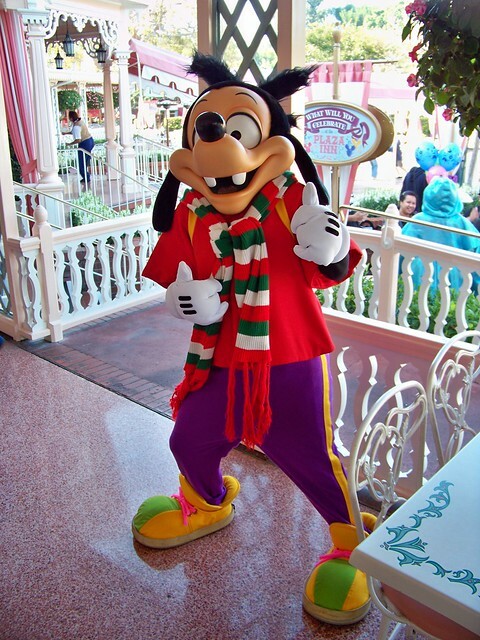 The liveliest character restaurant is probably Goofy’s Kitchen. This is a purpose built character restaurant and so is well thought out with an easily accessible buffet and plenty of space for the characters to interact. It is also probably the loudest of all the character restaurants! Whichever of the Disneyland Character Breakfast restaurants you choose be sure to take your time and enjoy the experience. It is a unique opportunity to spend time with the characters. 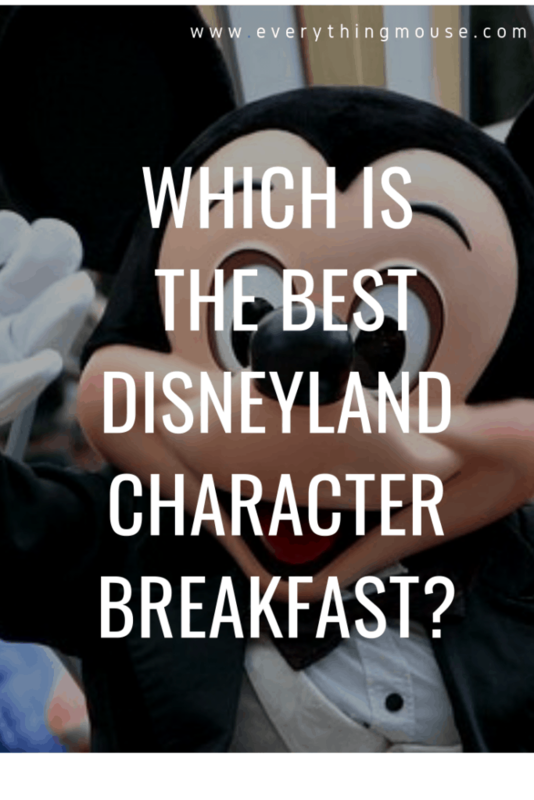 Which Disneyland Character Breakfast is your favorite?